In recent years, I and many others in our community have enjoyed the use of the lot at 425 M St. SW for our farmers’ market, local events such as the 202 Arts Fest and the DC State Fair, and the Friday night markets. This communal space has helped foster a strong, diverse Southwest community. I love running into neighbors I know and meeting new neighbors in these informal, outdoor gatherings. The new renderings put forward by the developer for the space on that lot does not include an open gathering space for the community and ignores how the community currently uses the space. Ironically, the communal space we desire to maintain will actually be maintained within the resident-only courtyards in these buildings. I am not against development just to be against development. We need more affordable housing for District residents; however, these 600+ units offer the bare minimum with 8% of units at 60% Median Family Income. Only five units across the two buildings offer three-bedroom apartments at a reduced rate. Actually, there will only be five three-bedroom units available at all. A mere 0.8% of units will be available to families. This does not encourage families to settle in Southwest; rather, it offers a few, still overpriced options to less than a handful of families. (I can’t forget that DC has the highest median income in the country.) 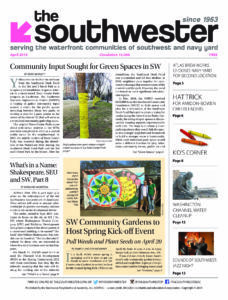 This proposal does not support the socioeconomic or racial diversity of Southwest as expressed by its residents in the 2015 Southwest Neighborhood Plan. This proposal (for more information, visit the zoning case # 02-38I, which can be found on this site: https://app.dcoz.dc.gov/Content/Search/Search.aspx) is taking away a valuable community asset, not just displacing it, and the suggested alternatives aren’t viable options. For example, at the March ANC meeting, representatives from Forest City and Perkins Eastman suggested using the Southwest Duck Pond and the playground adjacent to the library as spaces for these events. I value these spaces for our community and having tabled an event at the Duck Pond, I don’t see how it could hold the same number of people as the lot can. At the April 5 zoning hearing on this case, our ANC Representative Andy Litsky made some very important points about the traffic issues that will arise with these new buildings and the additional 1,000 people. (The two buildings proposed will have more than 600 units. I’m assuming at least a little more than half of these units with have at least two people in each one.) Zoning Commissioner Anthony Hood had a very interesting question to the developers as well, asking who from their development team is from Southwest. Their answer: No one. I understand that buildings will be built on this space, as it is privately owned and was previously approved in a prior PUD application (Case# 02-38). My suggestion for this development is to leave part of this land as an open communal space for the neighborhood’s use. It is not beyond reason to build a smaller building on the lot, offer more affordable housing units, and still maintain an outdoor communal space. There will still be profit for the developer to make from maintaining a communal space. It will be an appealing sale to whomever moves into their new buildings, and they can continue to charge vendors to use the space for these events, as they currently do. This is an important case for us as a community to consider. How do we want to build community in Southwest? Is it through high-rise luxury apartments or is it through programmed activities in communal spaces? Or is it both? If you are interested in learning more and getting involved in this case, please email saveswpublicspace@gmail.com or join us at the next zoning hearing on May 10 at 6:30 p.m. regarding this case.